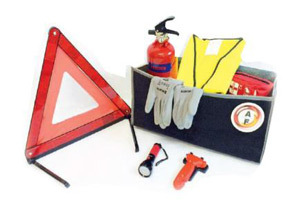 Car safety kits containing all you need for breakdown or roadside emergency situations are now available from Apex Fire for the low price of just €60 (including VAT). Please note that the glass-breaking hammer and seat belt cutter should be stored inside the vehicle, with a fixing bracket, so they can be easily accessed in an emergency. All car safety kit items are CE certified and come in a stylish grey carpet toolbag, complete with hook and loop fastenings that attach to your boot carpet via Velcro strips, to prevent any movement. We encourage everybody to carry one of the car safety kits. Contact us today to order.